February 27, 2017 – This week, our time machine turns Schwinn Sting-Ray bicycle. We’re pedaling our way to the end of Black History Month, with a last stop on the basketball courts just off the coast of Massachusetts. 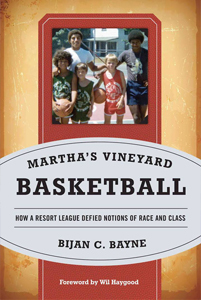 Cultural critic and sportswriter Bijan C. Bayne is here to share his latest book: Martha’s Vineyard Basketball: How a Resort League Defied Notions of Race and Class . The island off Cape Cod may not conjure up the sound of a basketball thunking on asphalt, much less the Civil Rights Movement, but Bijan describes the history happening right under the Converse of players from many backgrounds and colors, perched on all rungs of the social ladder, including names as diverse as Charles Lindbergh, James Taylor, Jaleel White, and Barack Obama. You can find our guest on Twitter at @BijanCBayne or check out his blog by clicking this link. And if you enjoy the topic of basketball history, be sure to check out Bijan’s first book: Elgin Baylor – The Man Who Changed Basketball .